Tammy Taylor Kolinsky Sable Brushes are so superior that they have even been voted the very Best Nail Brushes by Nail Technicians. I am very particular about my sculptured nail brushes, and a beautiful brush is the key to making Beautiful Nails. 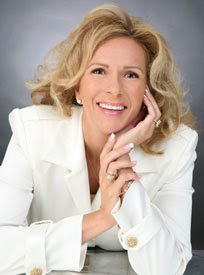 When I first started doing nails in my Salon, around 1981, I struggled with trying to find the perfect brush. I went through a lot of brushes and wasted a lot of money. At that time, there were 2 shapes of brushes; round brushes and flat brushes. I liked the round brushes because they would hold enough liquid to make a good-ball-consistency and they stroked the product well without leaving brush marks. What I did not like about the round brush was how pointy it was when I was working around the cuticle area, or how fat it was when I was trying to pat the product. I liked the flat brushes because they were better when patting the free-edge and working around the cuticle. But I did not like how the flat brush could not hold enough liquid, making the balls too dry, too small and leaving brush marks in the product. So, I customized my own brush! I would take a round brush and then squeeze the Ferrule with pliers to put a slight crimp in it. This gave me a brush that had the consistency and flow of a round brush, and the control of a flat brush. This slightly crimped Ferrule, that I created over 25 years ago, is used by most nail companies today, and is the most popular style in the Nail industry. The small is about a #6 - great for toenails. The medium is about a #7 – great for short to medium nails. The large is about a #8 – great for medium to long nails. The X-large is about a #9 – great for long to extra long nails. The larger the brush, the more liquid it holds and makes a bigger ball. 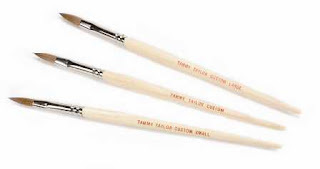 The Tammy Taylor Custom “Flat” Kolinsky Sable Brush is a little flatter then the Tammy Taylor Custom “Oval”, which makes the “Flat” brush really easy to sculpt free-edges, and it still holds plenty of liquid for ball consistency and flow. The small is about a #6 – great for toenails. The Tammy Taylor Striper Brush. The Tammy Taylor Detail Brush. The “brand new” Tammy Taylor 3-D Nail Art Brush. I am very particular about my own personal brushes. I have a certain way I like to clean my brushes, and a certain way I like to form the tip while they dry. Also, I have a certain way to store them. When you take proper care of your Tammy Taylor Kolinsky Sable Brushes, they can last for years. I always have at least 3 brushes ready, and this way I can rotate my brushes while I am doing nails. When one brush gets dirty, I place it in my Tammy Taylor Conditioning Brush Cleaner and then use a different brush. By having extra brushes, I am not in a hurry to clean my brush so I do not start picking at it or cutting it. Good brushes like these are expensive and they need to be taken care of. I only use Tammy Taylor Conditioning Brush Cleaner to clean my brushes. I do not use acetone or polish remover because the chemicals ruin the sable hairs. I use the “black” deep-well Tammy Taylor Dappen Dish for my liquid and I use the “white” deep-well Tammy Taylor Dappen Dish for my brush cleaner. By having the 2 different colors, I do not accidentally make nails with my brush cleaner. After my brush has been in the Tammy Taylor Brush Cleaner long enough to soften the hard acrylic, I just wipe it off on a Tammy Taylor “Towelette”. Be careful not to bend the hair too much when wiping, as the sable hairs can break off. After cleaning my Tammy Taylor Brush, I dip it in my Tammy Taylor liquid and slightly wipe it off to shape the tip. The Tammy Taylor liquid also conditions and helps keep the brush shaped just how I like it. If your Tammy Taylor Kolinsky Brush hairs get bent, just run warm water over the hairs and re-shape them. Then, store it in my Tammy Taylor Form Holder, with the brush hairs pointing upward. Are You Scared to Touch Anything? Are you scared to touch anything for fear of germs? When you are in Public places? Or when your children are playing in Public places? Well, you do not need to worry anymore. All the same wonderful things I know you want for yourself and your family. Only Pennies Per Use, Up To Ten Times More Uses Than A Sanitize Gel Of The Same Size.